Santa Monica, California's economic prospects, after it was founded in 1875, were shaped by railroad interests that hoped that the town would become the closest port to nearby Los Angles, only 14 rail miles away. Senator Jones' Los Angeles and Independence Railroad went bankrupt when his silver mines closed after prices plummeted during the panic of 1876. By 1880 the town was in a deep business depression and the population had bottomed out at 350 citizens. However Santa Monica's location as a beach area close to Los Angles helped revive it. The number of excursionists and summer campers began to increase steadily. The Santa Monica Hotel reopened in 1882 and J.W. Scott remodeled it and added a twenty room addition the following year. The economically depressed town revived after the Southern Pacific became interested in the abandoned railroad and port to counter the rival Santa Fe Railroad's attempt in 1885 to dredge a port in nearby Playa del Rey. They had bought Jones' railroad in 1877 for $195,000, less than one fourth the capital originally invested, but at the time had no intention of competing with its port operations in San Pedro. As real estate values surged, people and businesses began moving back into Santa Monica. J.W. Scott purchased a tract of beach front property between Railroad and Front Street, subdivided it into forty lots and sold thirty lots for $30,000. He then used the money in 1886 to begin construction of a first class hotel called the Arcadia (on the lot where the Loew's Hotel stands today). When the 125 room hotel opened on January 25, 1887, it became the finest seaside hotel in California. It was located on the edge of the bluffs, just south of the railroad tracks that led to the old wharf. The rectangular structure's five stories rose from the beach on the ocean side, but was only three stories high at its inland entrance. It had a dining room for 200 guests, a sitting room, parlor, ladies billiard and reading rooms on the first floor. 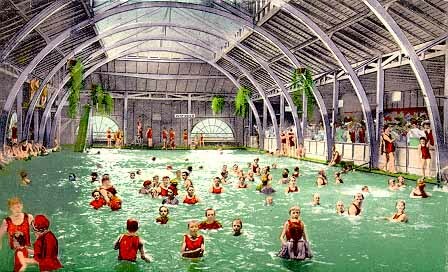 There was a ballroom and conservatory on the lower level, and therapeutic salt water baths were available. 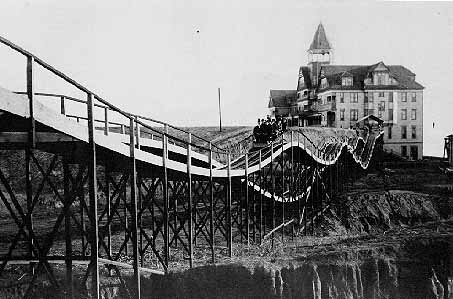 The Arcadia Hotel had a unique Thompson Switchback Railroad which carried passengers across the arroyo and back, on a short 500 foot undulating track that used natural gravity. One end of the gravity railroad terminated at the Arcadia Hotel and the other end on the north side of the Southern Pacific tracks. The Southern Pacific and Santa Fe Railroads became locked in a deadly rate war that year. Fares from Kansas City to Los Angeles, normally about $100 began plunging. By March 6, 1887 the dropped to $8, but rose to about $25 during the next few months. Easterners and midwesterners, recognizing a bargain when they saw one, came to California by the thousands. Los Angeles' population mushroomed to 80,000 that year and by summer 2000 to 3000 people a day were discovering the pleasures of Santa Monica's North Beach tourist facilities. The announcement that the Southern Pacific would build a port in Santa Monica temporarily fueled a real estate boom. But after the Santa Fe's dredging equipment failed to dent a hard layer of clay in the harbor they were building and abandoned the project, the Southern Pacific scrapped plans for their project, too. Tourism remained the town's primary business. The Southern Pacific brought 200,000 tourists to Santa Monica in 1889, and thousands more arrived by their own conveyance On one warm Sunday 12,000 visitors arrived to watch a balloon ascension. Los Angeles' rapid growth of trade in the 1880's let to a need for an improved harbor in Southern California. Senator Jones and Santa Monica civic leaders campaigned for a harbor nearby. When Congress allocated $250,000 to begin work in San Pedro, the Southern Pacific suddenly changed their mind, claiming that the area was too rocky. But the real reason was the success of Santa Fe's Redondo Beach wharf which opened in 1889. Despite two Army Corps of Engineering reports favoring the San Pedro site, the Southern Pacific began driving piles on July 25, 1892 on a mile long wharf at the foot of Temescal Canyon. They secured a railroad right away along the Santa Monica bluffs to reach their wharf. Port of Los Angeles' began operation on May 11, 1893. During the real estate boom that followed Senator Jones was determined to make North Beach's tourist facilities the best on the Pacific Coast. He formed the North Beach Bath House Company in December 1893, and with $50,000 began building the 450 x 150 foot structure north of the pier. 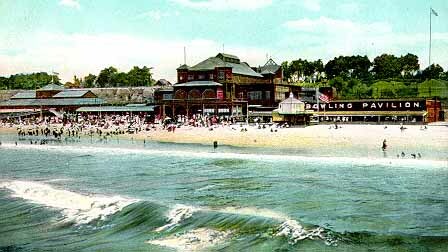 When it opened in the spring, the bath house featured a large hot salt water plunge where swimmers were watched by full-time attendants as well as spectators who filled the bleachers The complex also featured an elegantly furnished parlor, ballroom, roof garden, bowling pavilion, and the Pavilion Restaurant with two dining rooms. North Beach's virtual monopoly on Santa Monica's tourist facilities began to weaken slightly in 1892 when Abbot Kinney and his partner Francis Ryan bought ocean front property south of Strand Street. They subdivided their land, that gently sloped to the sea, into small lots for beach cottages. Then to lure potential property owners to their Ocean Park resort, they built a golf course, race track, tennis club and country club clubhouse. Several years later they built a 1250 foot long pleasure and fishing pier over Santa Monica's sewer outfall at Pier Avenue. This competition encouraged North Beach developers to add attractions to make the area Santa Monica's premier tourist area, especially after Sherman and Clark extended electric trolley service to the city in 1896. In 1898 the Santa Monica Beach Improvement Company was organized with a capital stock of $100,000. It was a syndicate headed by the owners of the Arcadia Hotel, Santa Monica Bank and the Pasadena and Pacific Electric trolley company. The company's goal was to secure a lease of as much beach frontage as possible, build a pleasure wharf at the site of the old railroad pier, erect a plank boardwalk, and erect attractive cottages and suitable buildings for beach activities. However, after selling stock in the venture, the Southern Pacific claimed an exclusive franchise at that site. Determined to proceed, they did built their narrow 700 foot long pleasure wharf at a location midway between the old railroad wharf pilings and their North Beach Bath House. The company only built part of their planned boardwalk and none of the planned structures. Others, however, built an auditorium four years later to attract some of the numerous conventions that met frequently in Southern California. While North Beach was much more straight-laced than Ocean Park, each summer a few carnival ride operators set up attractions on the beach near the pleasure pier. At various times their were steam driven Ferris wheels, a haunted swing inside a tent, portable merry-go-rounds and a shooting gallery. North Beach would soon lose its popularity after 1905 when Abbot Kinney's nearby Venice of America resort captured the public's fancy and imagination. His planned community complete with a network of canals, 1700 foot long pleasure pier with restaurant and auditorium, salt water bathhouse, and a Venetian styled business street, became Southern California's most popular beach resort.